Back in August, Bryan traveled to Switzerland for work, leaving Madelyn and me to enjoy some major girl time for a week. 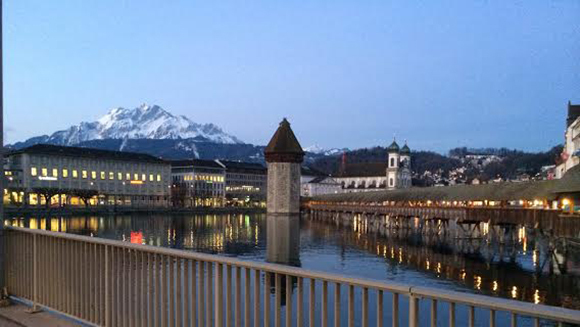 Most of his trip was focused on work, but he had one full day to explore Lucerne and took in the mountaintop views to see the gorgeous lake with a soundtrack of famous cowbells surrounding him. The cows peppered the hills and their bells rang out with trademark forte. He also lived like the locals and had a night out during their shopping night. Apparently, one night a week, the town stays open later and locals can get their shopping done after work. I haven’t decided if I like or dislike this Swiss concept. I’m very neutral about it. Bryan sends me pictures of beautiful Switzerland at dusk while I eat cereal for dinner and sneeze through Santa Ana winds back home. Anyway, during his big night out, he bought some chocolates for me (good man) and some souvenirs for his daughter. 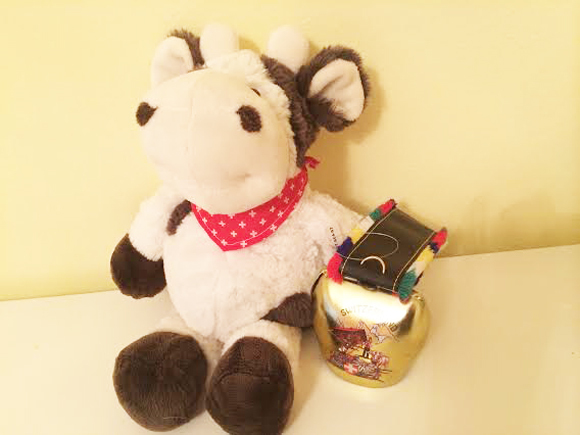 To commemorate the signature aspects of Switzerland, he brought back a cute miniature cowbell and a soft plush cow with a bandana around its neck with the Swiss flag design. These were really the first presents Bryan had ever bought for his daughter all on his own, and I love that he picked it out in the land of milk and milk. When he brought home the souvenirs, Madelyn loved up on the cow right away. She had just turned two, and we asked her what she wanted to name the cow: Moo. Very original and clever. Moo went to sleep with her that very night and even trumped Baby for the clutches of her toddler hands. On excursions to the market or long rides in the car, Minnie became old rat, and it was all about Moo. Her small play purse that usually holds bracelets and crayons and other random do-dads was suddenly being opened as wide as possible for Moo to fit inside, but we had to explain that Moo was too big. So with the purse dangling on one arm and Moo hugged up against the other, Madelyn meandered throughout her days, cuddling with her bovine beauty. For three solid weeks, Moo was THE toy to enjoy. I don’t know if it was because Moo was so spectacular or if it was because Moo was just new, but Madelyn was quite attached. At the end of September, we were packing to go on a family trip to San Francisco. Bryan had business up there and Madelyn and I tagged along to see some friends and the sights. I was putting together her Keep Madelyn Happy bag and tossed in some books, coloring materials, a baby doll, and other necessities, and Madelyn brought me Moo. It was imperative that cow come with us and I didn’t even blink about it. So Moo enjoyed its second airplane flight in just one month, this one significantly shorter. Moo slept in the crib at the hotel, joined us on BART, ate sundaes at Ghiradelli, rode on a cable car, and accompanied our walks through Union Square, the Embarcadero, and even afternoon tea at Neiman Marcus. Moo got to do more than most kids do in their childhood, so this was one privileged plush. After four days in the city by the bay, we were scheduled to return back home. The morning of our flight, we laid out all of our clothes and accessories we’d need for our flight and packed up the rest, all while getting dressed and ready. Madelyn was a wild child that morning, and continued to move around the piles we’d strategically placed throughout the room. Time was ticking and we had to make our flight, so after we’d zipped up bags, the hotel room door closed behind us. On our way to the airport, after our cab driver got pulled over and earned himself a ticket with us in the back seat (um, awkward, by the way), I asked Bryan, “Moo is in the carry on, right?” He hadn’t seen Moo. I asked Madelyn if she was holding Moo. She was not. I told Bryan I could not remember actually physically placing Moo in any bag. I knew I had Moo in a pile to bring with us. But my brain was scanning Moo’s whereabouts and it was coming up blank. When we arrived at the airport, I looked as best I could in the bags, and there was no sign of Moo. My heart sank and I knew that Moo was probably back in the hotel room. I called them right away, as any parent would when trying to locate a missing best friend, and they said they’d look and get back to me. My only hope was that Moo was in the nooks and crannies of the luggage and we’d find it when we unpacked at home. No such luck. Moo was never in any of our bags, and we turned them inside out. In the days that followed, Bryan and I both spent time on the phone with several different employees of the hotel: our housekeeper, head of housekeeping, the lost and found director, even the general manager of the entire property. They were all looking for Moo but Moo was not mooing back. I know whole heartedly that Moo was left in the room. I’m not accusing anyone of taking the kid’s toy, but it’s possible it got lost in the laundry. Their outsourced linens agency said they looked, and Moo hadn’t surfaced in their loads. Madelyn asked for Moo often, but we just sighed and told her Moo stayed in San Francisco. She seemed satisfied enough with the answer, but it still made us sad. As silly as it sounds, I cried over Moo. I love how special Moo was — it came from another country that Madelyn’s daddy visited while traveling for work. It was such a daddy/daughter experience they both concurrently had together and independently. Moo was cute, too! The cream-colored cow had light brown spots and was no cheapy-looking stuffed animal. I loved its red bandana with the Swiss crosses. It was finely made. Moo looked proud to be a cow. Months passed. I got a call from the hotel about four months later while walking through Costco. The director of housekeeping with a very heavy accent explained to me that they’d found a soft cow in their lost and found. She tried to describe it to me, but I couldn’t understand much. I asked her to text me a picture and right there, between the package of 42 AA batteries and the trash bags, my heart pounded as I waited for the text that could show Moo’s face. Would Moo be dirty and damaged? Would the bandana still be attached to its neck? Would Moo have stuffing popping out, exhausted from its mystery journey? My phone dinged and it was a picture of a cow, yes. But a cow that was not stuffed and looked like a mini blanket. It was not Moo at all, but some other child’s missing loved thing. I hope that other child is hangin’ in. This event inspired me to look for Moo myself. If it meant purchasing another Moo online, I would. But the store that Bryan had bought it from did not have an online shopping cart so I could not even see their inventory. I emailed them and described Moo, asking if they could send a new one and take an order over email. I never heard back. They probably trashed that crazy American lady’s email as soon as it came through their inbox. I’m sure they thought I had mad cow disease, myself. I gave up on Moo again and the search for Friedman’s Most Wanted cow went on the back burner. In February, Bryan found out he’d have to do some more business travel in Switzerland. It’s no surprise that the first thing I thought of was Moo 2. Bryan only had four nights in Switzerland and he checked in every day with me to tell me the status of Moo 2. I was teaching during the day while Madelyn was with my mom and I got a text while I was at work. I actually breathed a sigh of relief. She knew that Daddy was in Switzerland and we told her that he was getting her a new Moo. Whenever she’d hear anyone mention Daddy or Switzerland, she’d proudly share: “Daddy get new Moo!” I don’t even know if she knew what this meant as it had been a while since she’d even mentioned her old cow, but she seemed excited anyway. Bryan came home two days later and the reunion with Moo 2 took place when she woke up the next morning. Bryan told her he had a surprise for her and we turned her around so we could place Moo in front of her and then she opened her eyes and walked toward the cow. It was like reuniting with an old friend: excited, but unpracticed; giddy, but reserved. She spent the rest of the morning hugging Moo 2 and carrying her old-new pal around. Moo 2 has since been a staple in her crib, cuddling her to sleep along with Hello Kitty, Minnie, Doggie, Sheep, Bunny and Lovey. 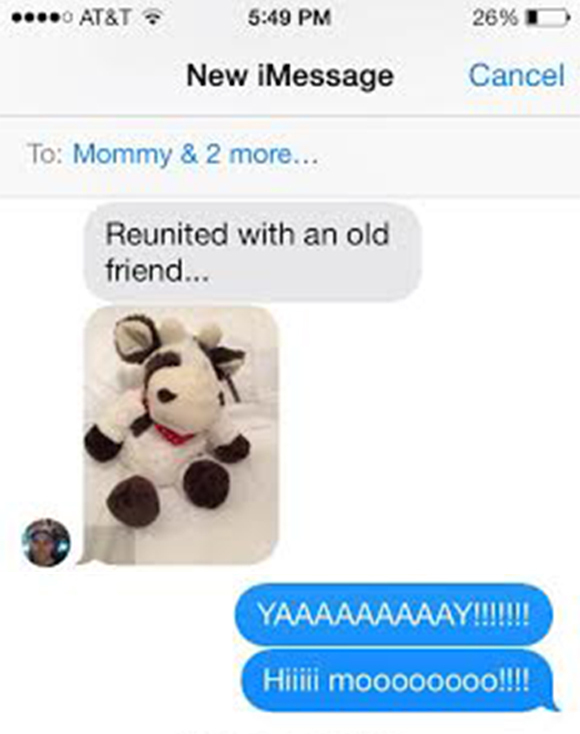 In fact, Moo 2 may also be to blame for some late night carousing in her room, as she sings and chats with all of her stuffed friends. But I don’t mind. It’s okay for her to party even though the cow came home. I felt so sad when your 1st Moo was lost—I think I was more sad than YOU. How lucky you are that Daddy was able to find you a new Moo to love & hug. The adventures of Moo, the Cow & Moo 2 will always be a story to remember when we reminisce about when you were a little toddler. A similar story happened with your Mommy when we went on a trip to England. I didn’t remember packing her blanket when we left our hotel about 2 hours earlier. In a panic, I made Poppa stop on the highway and I jumped out of the car and ran to the trunk so I could check your Mommy’s suitcase as she was almost in tears. Thankfully, the yellow blanket was safely packed away in her suitcase and Poppa didn’t have to drive 2 hours back to the hotel. I’ll never forget that scary incident.